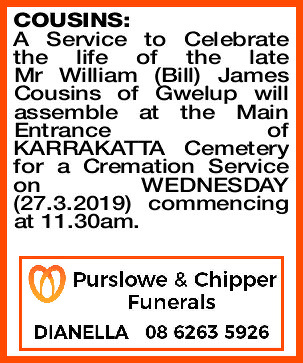 A Service to Celebrate the life of the late Mr William (Bill) James Cousins of Gwelup will assemble at the Main Entrance of KARRAKATTA Cemetery for a Cremation Service on WEDNESDAY (27.3.2019) commencing at 11.30am. 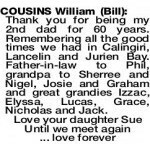 Treasured memories of my/our Dad and Pa. I will always remember my days on the farm with you. Days at Lancelin for holidays with the kids. 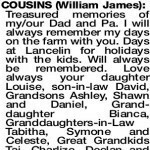 Will always be remembered. 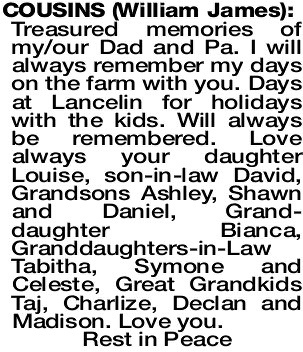 Love always your daughter Louise, son-in-law David, Grandsons Ashley, Shawn and Daniel, Grand- daughter Bianca, Granddaughters-in-Law Tabitha, Symone and Celeste, Great Grandkids Taj, Charlize, Declan and Madison. Love you. Thank you for being my 2nd dad for 60 years. Remembering all the good times we had in Calingiri, Lancelin and Jurien Bay. 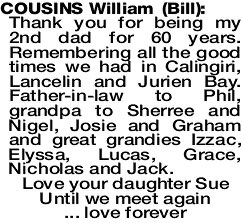 Father-in-law to Phil, grandpa to Sherree and Nigel, Josie and Graham and great grandies Izzac, Elyssa, Lucas, Grace, Nicholas and Jack.